We just finished compiling a MetaData Extension that runs within Illustrator and will pragmatically run on a map or a folder of maps and ‘lift’ the site or sites. 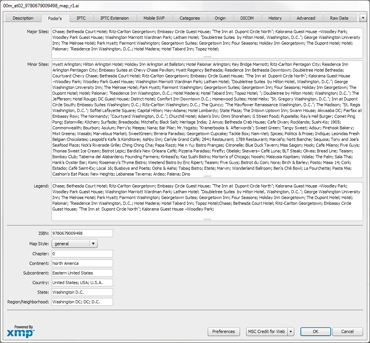 The extension looks at font sizing, color, style, layer information and a few other variables and copies that information and places it within the XMP file info tab. It’s very geeky and exciting. Now we’re running this extension on thousands of Fodor’s legacy maps, getting those ready for the web and eBook format. The MetaData or Tags will travel with the map images making them searchable from within a eReader (if supported) or search engine if posted online. We’ve created a custom ‘Tab’ for internal use and organization. This includes ISBN both 9 and 13, chapter, style of map, title – long and short, file name, version number, etc. We also added a ‘clean up’ script that removes any empty type fields, removes empty layers and refines grouped objects into less complex grouped items. All this making the file sizes smaller and easier to manage while also searchable. Posted in Extensions, Fodor's, Scripting and tagged with Extension, Fodor's, Illustrator, Script, XMP. RSS 2.0 feed.